Visit this wonderful city with an experienced guide at your side. Immerse yourself in the medieval atmosphere that exudes the air of the famous Palio. A comprehensive guided walking tour will take you along the medieval streets, admiring the splendid squares and medieval monuments, ending up at the famous Basilica of San Domenico (inside visit), a treasure chest of Renaissance art built in the 13th century, dedicated to St. Catherine of Siena of which preserves a relic. Then you will walk along the narrow medieval streets of Siena, admiring its splendid palaces until you reach the magnificent Cathedral. The guided visit continues with a tour in a Museum and an Oratory of a Contrada**, where you can experience the authentic atmosphere of the town. The Contrade (districts into which the town is divided) are the real core of the local social life, where inhabitants of each district compete with each other as they devote themselves to preparations for the well-known Palio horse-race. The contrada is not simply a district: it is a small state having its own legacy of traditions, memories and emotions, including its own flag and anthem. The Museum of a contrada, as well as its Oratory, is therefore the heart of the district. This is an intimate and secret place – with exclusive access – containing historical documents and wonderful relics of the famous Palio, as well as magnificent works of art which are normally not disclosed to the public. In other words, a truly exclusive and valuable experience. The guided tour will end in the Piazza del Campo, one of the most beautiful in the world. 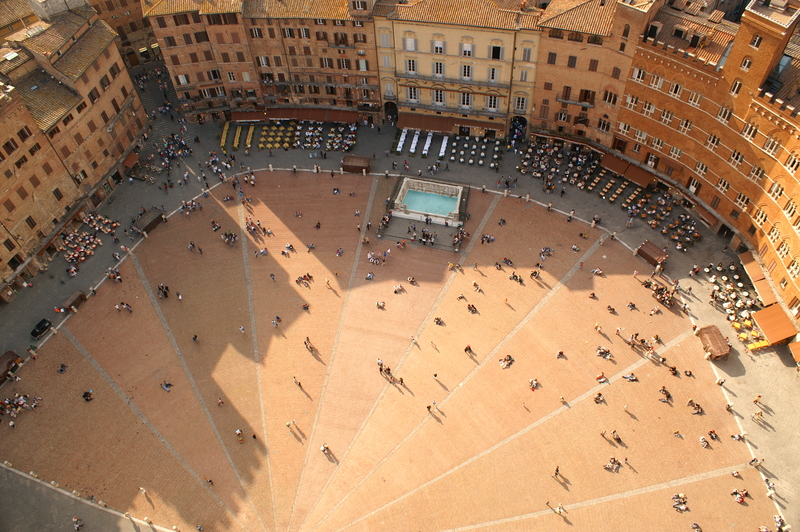 You will be enchanted by shell-shaped square where every summer will take place the exciting Palio horse race. In the square you can admire the Palazzo del Comune, a symbol of elegance and power in Siena. It’s considered one of the finest examples of gothic secular architecture and it stands as the natural centre of the square’s architectural perspective. To the left of the Palazzo Pubblico rises the imposing Torre del Mangia, a beautiful combination of height and elegant slightness of design. You will be delighted by the image of this unique square with its unrivalled monuments and it will be preserved in your mind forever. What’s included: local guide in Siena, museums entrance fees:Cathedral/Piccolomini library/Museum and Oratory of a “Contrada”. Persons: 1 guide per 25-30 pax max.